Update 1: More info about this update at the WordPress blog. 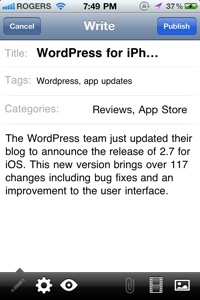 WordPress for iOS has been released in the App Store. This new version brings over 100 changes including bug fixes and an improvement to the user interface. After three months of development, WordPress for iOS 2.7 is now available and fixes over 100 bugs, which means better performance and fewer crashes. We’ve also cleaned up the user interface to make it easier to manage your blog. For example, now you can just use “Pull to refresh” to update the Comments, Posts, and Pages lists. 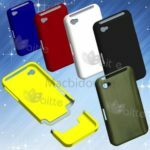 This blog post was written within WordPress for iPhone and so far, it’s been great. The WordPress team noted on their blog that post formatting options will be coming once the app is more reliable. While I support the continued updates to this app, other options such as BlogPress offer friendlier posting methods. Check for the update in the App Store. PS – I spoke too soon. This app crashed while uploading a photo.